You can play with me in person at the Schaumburg Go Club! Go is much more fun in person! 9/26/09 Tourny @ UIC again. 3-2 as a 1k. Screwed up a 100+ point kill in one game. I feel good about my go at the moment, thinking about deciding to be 1d. 03/14/09 ( Pi day! ): 2-2 as 1k at Chicago quarterly tournament. I guess I am a very average 1k, judging from my past three tournaments. kb: Pi day. I can't believe I pay taxes for this. 12/07/08: 2-2 as 1k at All Iowa tournament. kb: Fun game against you at the tournament, Daniel! 09/13/08: 4-0 as a 2k at the Chicago quarterly tournament. I think that will bump me up to 1k. 08/11/08: Went to Congress as a 2k. 3-3 in the US Open, 2-1 in the diehard, 3-1 self-pair. Not bad, esp. considering two of my open games were won games until I screwed up near the end. It was a blast. 07/28/08: In spite of not studying and only barely playing for 3 months I somehow went 4-0 at the Chicago quarterly tournament. I played at my official rating of 2k. Planning on going to congress! 03/08/08: 3-3 at the tourny at UIC. I played at my official AGA rating of 2k, but I think I could have entered at 1d and gotten the exact same results if I had played the same people (which I wouldn't have, of course, but that's not my point). All of my wins were easy games; two of them were against previously unrated people, one of whom entered at a rank they couldn't defend, the third win against a solidly rated 2k. Of my losses, one was against a solidly rated 2k because I played bad, one was against someone who entered as 1k but probably should have entered as 1 or 2d, and the last one against someone who (probably correctly) self-promoted to 1k: I was ahead and got lazy. Unfortunately, to the AGA rating system, it appears that I beat a 2k, lost to a 2k, lost to a 5k, beat two unknown people and lost to an unknown person. As a result my rating didn't change much and my sigma dropped. This is very frustrating. I feel like AGA ratings are wildly inconsistent and the only way to achieve a "correct" rating is to self-promote, but TD's are reluctant to let you do that. I also feel like the 2k-1d crowd of players (at least here in Chicago) is under-ranked as a whole compared to the 2-3d players. I don't think there are any 2 or 3d players in the area who can give me the 3 or 4 stones AGA says they should. There's a 3d at club I've beaten even a couple of times. 06/02/07: I was 2 and 1 at Lakeview Go Club's Baduk on the Beach tournament. Entered at 2 kyu. Played well in the morning and was unable to read two moves ahead after lunch. Weird. Despite that I feel stronger (it's weird, a couple weeks ago playing as a 2k suddenly was a lot less work). We'll see if I can hold down 1 kyu at SGC, which one of my morning wins bumped me up to. 04/08/07: Attended the quarterly tournament at UIC. 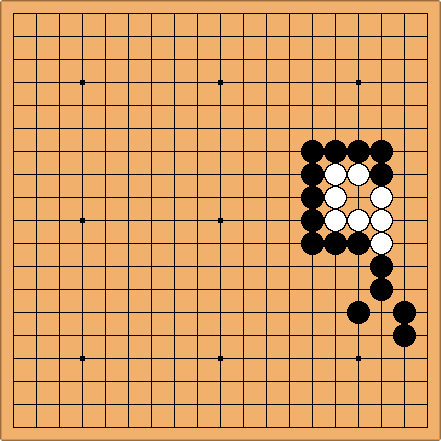 Entered as a 2 kyu, won 3 out of 4 (compare with last week; a good night's sleep does wonders for your game). The only game I lost was against the only person I beat last week. Also, I won (by half a point!) while giving four stones to someone that I couldn't give 2 stones to last week. Still can't believe I won that one. I guess I'm only two stones away from shodan, but I still don't feel like I know anything about this game. 04/01/07: Attended Iowa Cup in Ames, IA. Had fun, but I only won one of my four games (I thought I was entering at 2 kyu but I think they actually just had everyone at their official ranks-- which would be 3k for me). I'll chalk up my poor showing to a lack of quality sleep. On the plus side, I was counting in every game, and counting well. 02/17/07: Attended first annual Cream City Classic in Milwaukee. Many thanks to Richard Hayes for putting it on. I self promoted to 4 kyu, and won 5 games with correct handicap (I played a 5 kyu, three 2 kyus, and a 10 kyu. Giving 6 stones is hard!). I lost two games-- the first one was a four stone game against the 5-dan (because he needed another game in the morning to make the playoff, I was available, and the max handicap for the morning session was 4). Shockingly, it was almost close; I almost managed to pull some stones out of the center in a capturing race. The second one I lost was even with a 3-dan (because I made the playoff). I had a chance to either try and save all of a group, or save half of the group, but I couldn't read it out-- I tried to save the whole thing because I was behind a little, and ended up losing it all. It was a blast; I guess AGA will promote me to 3 kyu now. 12/09/06: Quarterly Tournament at UIC: Entered at 5 kyu (my AGA rating). Didn't self promote to 4 kyu because of my prior results at that level, and because I haven't done any studying since then. Won 4 of 6 games, and the two I lost were due to inattention, so I think I might actually be 4 kyu for real, or maybe a weak 3 kyu. Also I'm playing quite a bit faster (as evidenced by being able to get 6 games in). 06/03/06: Quarterly Tournament at UIC: Entered at 4 kyu, just barely won 2 of the 4 games. Didn't really deserve to win one of the games; didn't really deserve to lose one of the games. Both of my lost games were (probably) lost due to time pressure, sadly. I'm probably a weak 4 kyu. 05/20/06: Des Moines, Iowa. Played as a 5 kyu. Won three, lost one-- second place in the top division! Lots of fun. I felt under time pressure for the whole time; I play too slow I guess. 03/04/06: "Survival of the fattest"-- quarterly tournament at UIC. Entered as AGA 6k, won 3 lost 1. Had fun. I definitely need to play with a clock... the first game went two and a half hours because I was reading everything too much (I won, though). I left this for dead in the one game I lost-- but white managed to live. oops. 10/20/05: I can usually remember and replay at least 100 moves of any game I've just played. Very useful for talking about the game afterwards. June 5th 2004: Chicago Tournament result: Entered as a 14kyu, had 3 wins and 3 loses. Yay! December '03/January 04: started playing Go. KGS says I was 18k. I think with the rank deflation there that's like 24k or worse nowadays. Life and death question moved to BQM 180. LukeNine45 KGS Commented Game 1. A game I played a long time ago when I really sucked bad. Leave me a message if you're really that bored. Anonymous: Are the ranks on KGS still deflated and if so by how much. Also what is SDK status?